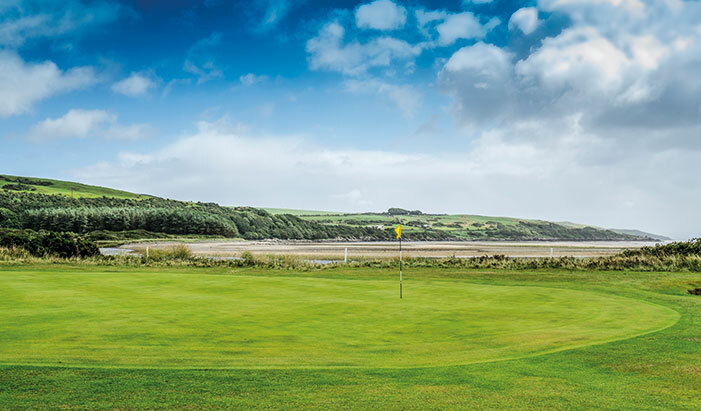 Situated on the shores of the scenic Luce Bay, Wigtownshire County is a wonderful links layout measuring slightly more than 6,000 yards. Built in 1894 and extended to 18 holes almost a century later in 1987, the course affords views across to the Isle of Man on a clear day but, when the wind blows, it is an altogether tougher test. The course make-up includes three par-3s, 14 par-4s and one par-5. A large practice area lies adjacent to the first tee and, because of the sandy soil base and proximity to the sea, there is rarely a problem with water lying on the course and winter greens are rarely used. 12th - This par-4 starts with a daunting tee shot from an elevated tee box, with out of bounds tight all the way down the right-hand side. You’re normally hitting into a prevailing wind, which adds to the challenge of this enjoyable hole.